Fort Lewis College associate professor Heidi Steltzer’s career has led to groundbreaking research, recognition as an outstanding teacher and a voice as an advocate for women in science. This year, it will also lead to the Arctic in Greenland and the bottom of the world in Antarctica. Steltzer, in her mid-40s, began a sabbatical year with a return to where she fell in love with alpine botany at the Rocky Mountain Biological Laboratory in Gothic, a ghost town near Crested Butte. After graduating from Duke University with a bachelor’s degree in biology, she earned her master’s and doctoral degrees at CU, Steltzer spent several years doing postdoctoral work at Colorado State University in Fort Collins. This summer will be different from her college days, as Steltzer takes her two sons, Roan Banks, 9, and Archer Banks, 6½, to Gothic for the second year in a row. Her husband, David Banks, will join them for a week-and-a-half at the bio lab. He has a doctorate in engineering and designs ways to make solar panels sturdier. Roan may be headed for a career as a scientist. After five weeks in Crested Butte, Steltzer will head to Greenland above the Arctic Circle as part of a project to create a curriculum about climate change for middle and high school teachers funded by the National Science Foundation. And December will present the greatest adventure of her sabbatical. Steltzer is one of seven Americans among almost 80 female scientists from around the world selected for the first installment of a proposed decadelong Homeward Bound program, beginning with a three-week trip to Antarctica. Funded primarily by a grant, the program has a long-term goal of creating a network of female scientists 1,000-strong, with the hopes they will collaborate on research and advocacy endeavors for sustainable practices on the planet. A chance encounter at Carver Brewing Co., while in Durango on vacation led her to pursue a position at the college, where Steltzer has become a respected biology and environmental science teacher since joining the faculty in 2009. In 2013, she was named the inaugural recipient of the Sulzman Award for Excellence in Education and Mentoring from the American Geophysical Union. Steltzer’s work in the classroom may end up being the best research project. Heidi Steltzer packs up the family Land Cruiser at her Durango home at the end of May before heading off to the Rocky Mountain Biological Laboratory near Crested Butte for a five-week research project with her sons, Roan Banks, 9, and Archer Banks, 6½. “The research equipment, which includes steel frames, data loggers, microclimate sensors and instrumentation for automated monitoring of plant canopies in mountain meadows will go into the Cruiser first,” she wrote in her blog about packing the vehicle for the trip. “I’ve researched how environmental change affects plants, ecosystems and human well-being in Alaska, Greenland and here in Colorado,” Fort Lewis College associate professor Heidi Steltzer said. The results of one study she was involved with, looking at the effects of increased carbon dioxide in the atmosphere and longer growing seasons because of climate change on alpine plants, were published in Scientific American, Nature and The New York Times. This year, for the second time, Steltzer is a visiting program faculty fellow with the Department of Energy, working with Kenneth Williams, an Earth-system scientist from the Lawrence Berkeley National Laboratory at the Rocky Mountain Bio Lab. Their project is measuring how plants influence the timing and amount of water in mountain streams that flow into the Colorado River. A paper published in 2009 recounted her study of how desert dust speeds up the snowpack melt. It’s important to control the factors we can, she said, because, some, like climate change, are a problem beyond local control. Her project in Greenland later this summer is under a grant through the National Science Foundation, working with a scientist from Pennsylvania State University who has been doing a 20-year field study on climate change in the bellwether country. Steltzer will investigate the impact herbivores, such as the musk ox and caribou, have on the plant life in the fragile environment above the Arctic Circle. When they return to the United States, the two will create a teacher workshop using films and stories to help middle and high school teachers include climate change and its impacts into their classrooms. To follow Heidi Steltzer’s adventures, visit her blog on the Mountain Research Institute website at www.blogs-mri.org/?p=1214. Visit http://nyti.ms/28Tlh7y to read The New York Times article about Steltzer’s research into lengthening growing seasons. 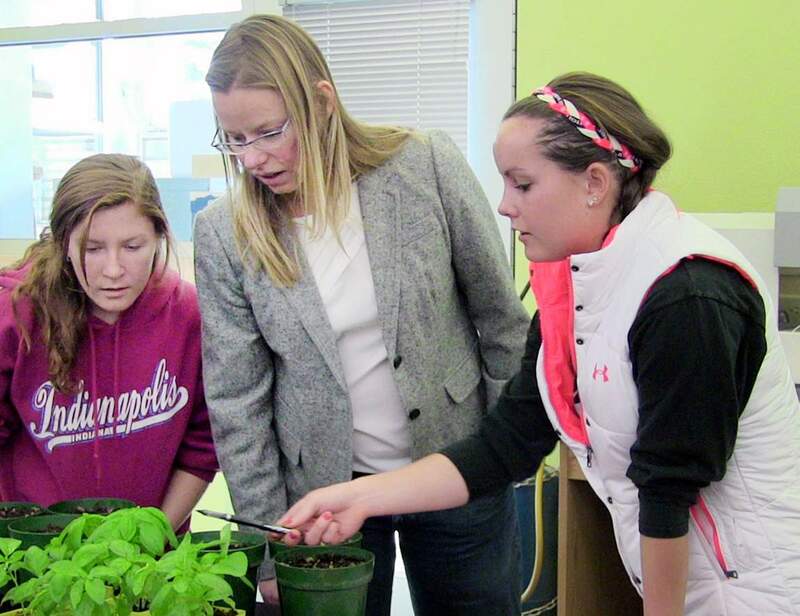 Award-winning Fort Lewis College associate professor Heidi Steltzer works with students in a botany class in 2014. Steltzer is on sabbatical for a year of research and writing that will take her from the top of the world above the Arctic Circle in Greenland to the bottom of the world in Antarctica.